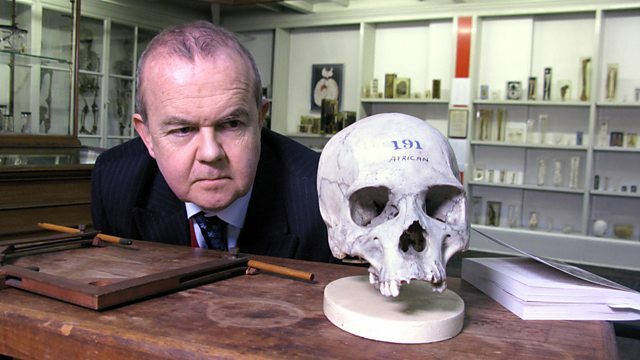 Ian Hislop investigates Britain's emotional history. He argues that we have the Victorians to thank for making the stiff upper lip a genuinely national characteristic. In the second part of his series about British emotion and identity, Ian Hislop argues that we have the Victorians to thank for making the stiff upper lip a genuinely national characteristic. He also shows how the belief became pervasive that suffering in silence was a service to society. And along the way he resurrects the stories of some remarkable - some might say bonkers - national heroes, like Captain Matthew Webb, the first person to swim the Channel. Ian begins by returning to his own boarding school, Ardingly College in Sussex, which he admits forged his own character. In a classics lesson, on the playing fields and in chapel, Ian explores how the English public school system instilled a powerful ideology not only into upper- but middle-class boys, preparing them to run both the country and the fast expanding empire. He shows how, later in the century, these ideas were successfully rolled out to the roughest parts of Glasgow and beyond through the Boys' Brigade, founded 25 years before the Scouts, as a panacea for 'degenerate' working-class youth. Ian also suggests that it was the Crimean War which heralded the democratisation of the stiff upper lip. The valour of ordinary privates was admired by all and for the first time they became national heroes - the new Victoria Cross was the first honour for which all ranks were eligible. Ian also discovers how even for today's Rifles Regiment holding it together unflappably remains essential. Victorians tended to believe that a good dose of emotional restraint could even fortify women, and that by being uncomplaining and endlessly supportive - 'the angel in the house' - women could aspire towards their own version of the stiff upper lip. Yet by the early 20th century some intellectuals, radicals and aesthetes were beginning to question the homogenised, quasi-industrial approach to character building - and were equating the stiff upper lip with hypocrisy and repression. And ultimately, the Victorian ideal of reticent stoicism shot through with imperial swagger could not survive the mud of Flanders. Yet it was precisely these values which fed the front line and persuaded so many officers and men to endure the First World War's unspeakable horrors. Ian goes to the battlefields of the Somme to tell the remarkable story of how one officer literally treated war as a game, using football to motivate his men to go over the top. Ian also introduces the weeping policeman 'Robert Emotional', explains the dark context to Charles Darwin's observation 'Englishmen rarely cry' and talks to MP Rory Stewart about how the stiff upper lip helped see him through his time as a deputy governor in Iraq.